Tragic events such as recent natural disasters and shootings at school affect many children and families. Although these events typically receive immediate media coverage and short-term supports, the long-term implications are often overlooked. The grief among children and adolescents experiencing significant loss generally emerges during the weeks and months following such tragic events. Although there are variations in the expression of grief, bereaved children and adolescents often struggle to meet the cognitive demands of school. Professionals at school, including, school psychologists, school counselors, and other mental health professionals have a tremendous opportunity to help identify and support students in need. Such support at school is helpful in facilitating healthy adjustment and coping strategies among bereaved students. The term grief refers to an individual’s personal experience, thoughts, and feelings associated with a loss. The term mourning refers to the externalized manifestation of grief. Mourning rituals, such as funerals, memorial services, and commemorative activities can facilitate grief. Culture influences the grieving process, and it is important to consider the vast range of ways that individuals and families mourn the death of others. For example, being sensitive to family preferences surrounding funerals or memorials helps ensure that you’re honoring their beliefs and values. It is also critical to note that some individuals may not feel comfortable expressing their grief at school, and instead prefer to do it privately with family. Grief is often emotional and can bring up different feelings simultaneously, such as sadness, anger, fear, or worry. Grief is also physical and can be felt in different parts of a person’s body. A child or adult who is grieving may have trouble sleeping, eating, and may experience somatic difficulties such as headaches or stomachaches. Finally, grief can also show up in someone’s behaviors, such as through crying, separating oneself from other people, and having trouble focusing or sitting still. At the same time, other individuals may appear to be less affected, despite the fact that they may still be experiencing many of these symptoms. This is because for some people, depending on their age and ability to deal with their grief, they want to continue to have control over their life and maintain normal routines. This can sometimes be helpful for them to manage their grief, especially while at school or in public. Because of the widespread effects grief can have on an individual’s functioning, it is critical that students, school-staff, and parents obtain effective support when grieving the death of one or more significant person. Elementary school children (6-12) are typically able to relate to death more easily than younger children. Children express grief differently due to a variety of factors, including their age, cognitive abilities, and cultural surroundings. Young children are typically better able to express their grief through play, make-believe, and drawings instead of verbally. They also tend to be more vulnerable to the withdrawal or excessive displays of grief of their caregivers and need consistent love and support. Elementary school children (6-12) are typically able to relate to death more easily than younger children and ask a lot of questions and obtain knowledge to better understand what happened. Within this age range, they understand that death is final and that all living things die. Adolescents (13-18) are sometimes more self-conscious and although they may be spending more time with friends, they may be less likely to share their feelings with their friends. Typically around ages 15-18, they feel more comfortable expressing their feelings and their grief is more similar to that of adults. Regardless of age, grief can significantly affect children and teenagers in various ways. Because of the variety of symptoms someone may experience when grieving, he or she may be less focused or motivated in school, or appear more withdrawn or tired. Furthermore, because a grieving youth may be experiencing a range of emotions, with some being uncomfortable for that individual, the youth may experience sudden outbursts of either anger or sadness. Families and schools are encouraged to remember that this is to be expected, and that youth need to be supported when experiencing these difficult emotions. However, additional support and follow-up may be needed if the youth is exhibiting a significant loss of interest in daily activities, is chronically absent, and has a significant fear of being alone, among other symptoms. These changes should be significant and not minor. Additional support and follow-up may occur in a variety of ways, such as having a school-based mental health professional, like a school psychologist or counselor, provide individual or group support to the youth. This will enable the youth to process difficult feelings, have the opportunity to share their story, and talk about positive and difficult memories. When appropriate, receiving support through a grief group can be particularly effective, as it can help normalize their feelings and make the youth feel less alone. Ensuring that teachers and families are knowledgeable about the grief process and how to effectively support grieving youth is also critical. It may be particularly difficult for teachers or families who are also grieving the same death as the youth, emphasizing the importance of self-care and support for adults. Given that most children will experience the death of at least one close or special person prior to high school graduation, and because the vast majority of children ages 7 to 18 attend school on a regular basis, it is essential that school-based professionals be prepared to effectively support bereaved students. Featured image credit: Chalk by Nikhita S. Public domain via Unsplash. Jacqueline A. Brown, PhD, is an Assistant Professor in School Psychology at the University of Montana and is a Nationally Certified School Psychologist. Her interests include school-based bereavement support, crisis prevention and intervention, and resilience in school-age youth. Shane R. Jimerson, PhD, is a Professor of Counseling, Clinical, and School Psychology in the Gevirtz Graduate School of Education at the University of California, Santa Barbara. Dr. Jimerson is a Nationally Certified School Psychologist and recognized by The American Academy of Experts in Traumatic Stress as a Board Certified Expert and Diplomat, and is included in their international registry of Experts in Traumatic Stress with specialization in working with children, families, and schools. 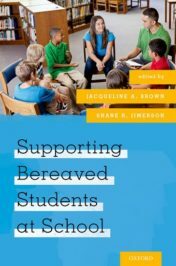 Together, they edited Supporting Bereaved Students at School (Oxford University Press, 2017).